Iceland is 2018 CMS Cow of the Year! The Canadian Milking Shorthorn Society is happy to announce that reigning National Show Grand Champion Richford Ironman Iceland is the 2018 Canadian Cow of the Year. Iceland is bred and owned by Don and Karen Richardson and family of Richford Farms, St. Mary’s, Ontario. Iceland has come to notoriety as the the two time Grand Champion at the 2016 and 2017 National Shows. She classified Very Good in first lactation, rescoring 88 points in second lactation. She is also the #45 LPI cow in Canada, building a strong index with breed-leading type as well as above average fat and protein production. 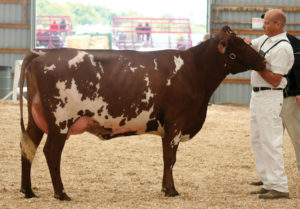 Her VG-85 dam by POD was bred by Jenna Kippen, descending from the “Irma” cow family from Shady Brae Farms and originally from Ridgeway Irma EX-7E . Iceland has been flushed this lactation, with embryos sold within Canada. The other two nominees for Cow of the Year were Oceanbrae Pingerly Betty, owned by Oceanbrae Farms of Miscouche, Prince Edward Island, and Prinsville Pingerly Star, owned by Prinsville Dairy Farms of Bloomfield, Ontario. The CMSS Cow of the Year is selected by votes by Society members. Iceland was recognized as Cow of the Year at the 2018 CMSS Field Day and AGM on July 28th, hosted by the Ashton Family in Port Perry, Ontario.